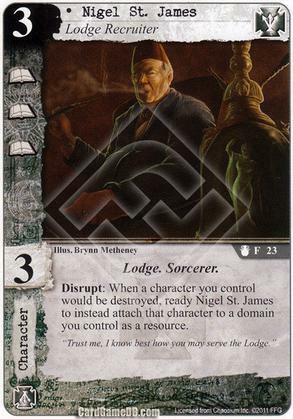 Flavor Text: "Trust me, I know best how you may serve the Lodge." This ability could be used on Nogel himself, correct? I'm assuming that's why it's a Disrupt rather than a Response. At the very worst, it seems Nigel could serve as an expensive Feed Her Young in that way. Second question: would you rather have Nigel or Terror of the Tides in a Khopesh deck? I already have plenty of characters who I'd prefer to have Khopesh, so Terror would only be in there as a blocker for buying me time and the occasional wielded of the Khopesh. Nigel could theoretically help smooth out my resource curve, but I'm skeptical that he'll trigger often, even with Khopesh around. What should I do? He can disrupt his owns destruction. But I don't really like him for Khopesh. Firstly there are better 3 cost ST characters. But, I would also worry about the timing of the damage given the Khopesh errata. Khopesh currently requires that you wound the attached character to choose and wound another, but 'receive your last wound' and 'destroy' are the same thing, there isn't any time between them, so a disrupt that goes off "when you would be destroyed" would seem to trigger before the last would is actually placed, meaning the Khopesh cost won't get paid, since Nigel is removed from play first. The timing thing is a bummer. I wasn't expecting that. I like how you interpreted Wooden Homunculus better because it worked in my favor! . I'll defer to your superior insight though. Poor Nigel. Narrow ability and tricky with the rules. I'm staying far away from him! Wouldn't The Thing Form The Shore be better than Terrror of The Tides for Khopesh? Yes. Terror of the Tides is a cheaper alternative though.